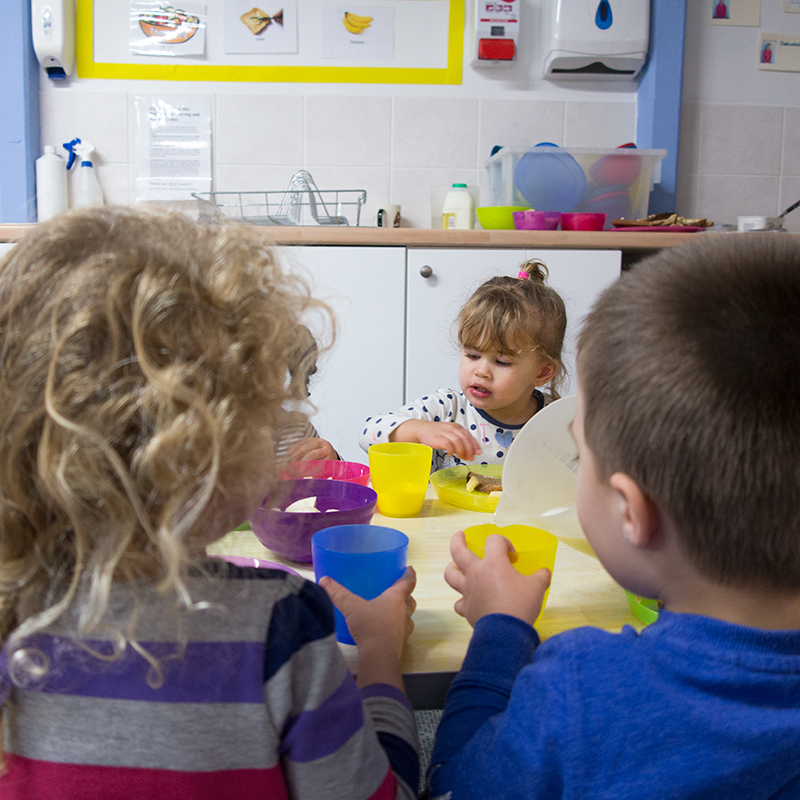 Our aim is to provide a warm and caring environment where the children in our care feel confident in taking risks in a safe manner, build up their independence and form relationships with their peers and a key-person from within the room. Caterpillar’s room has a team of 6 staff, and occasionally help from students. Additional staff come in over the lunch period to ensure staff ratios are met. 1 to 4 for two to three year olds. We have direct access from the room onto two garden areas; this allows for free flow play to the outside learning environment. We encourage parents to help settle children by having brief visits with their child, gradually leaving them for longer periods, please speak with a member of staff and discuss your needs. As the main educator and carer of your child please share any comments you think may be of help regarding your child, this enables us to provide your child’s individual needs, and observations are taken by your child’s key-person and are available for you to share, please speak to your key-person. When you feel your child is ready to come out of nappies and are ready to start using the toilet staff will support your child with this. Ideally, we aim for this before they move up into Butterflies room, as we have no nappy changing facilities in this room, but if you any have concerns speak to your key-person. Children move up to Butterflies room when they are three, usually about a month prior to moving up they will be taken for visits so they can settle into their new environment more easily. Below is a guide of the room’s routine however we do cater to the routine of each individual child especially with regards to their sleep and feed patterns. Butterflies children are in with the Caterpillars until 8.30. Morning snack/breakfast is offered to the children by a snack bar system, where the children are able to choose what they would like from a small selection of snacks which we provide. Cow’s milk is offered with morning and afternoon breaks. Outdoor coat and Wellington boots in cold weather – please label any items clearly as it saves confusion at end of the day. Feel free to talk to staff within the room whenever you have any questions or queries, or if you have any suggestions/ideas you may wish to pass on to us.